Better nutrition comes from a behavior change you can make today. What's In This Blog For You? I am writing this blog to recommend behavior changes for better nutrition. The intent is to provide information for making conscious food choices to build healthy eating behaviors that keep calories in check and weight under control. 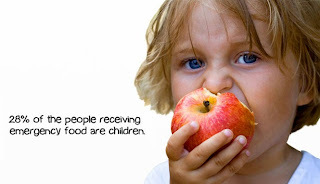 Food Insecurity - What is it? Why it concerns you. Disclaimer: The information provided within this blog is generalized and is not meant to apply to individual situations. Please use it in conjunction with advice provided by your doctor and at your own risk. KnowFoodNow 2011. Powered by Blogger.